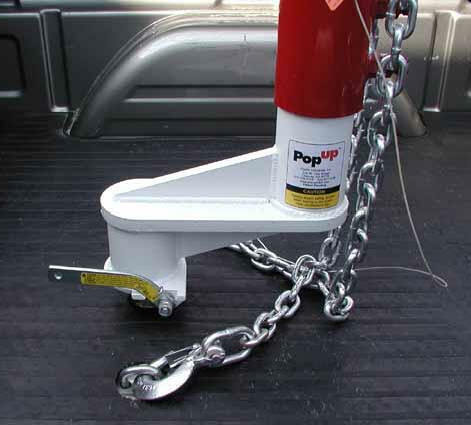 "Popup short bed truck hitch extention solution for your 5th-wheel trailer,gooseneck conversion,gooseneck extension, gooseneck adaptor,5th wheel conversion,5th wheel cushion, Popup Hitch,Cheap Popup Hitches, Recommended by MrTruck." RVCC complete adaptor, 7.5 in offset $695 add to cart New from Popup, RVCC 5th Wheel to Gooseneck conversion with a cushion coupler. 7 1/2 in offset for your shortbed truck. 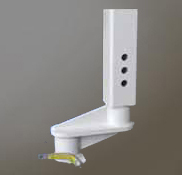 Fifth Wheel Gooseneck Conversion Adapter. Fitted with spring loaded 2-5/16" coupler. Coupler latches and unlatches remotely. 5" offset for added maneuverability. Height from ball to king pin is 12.5" extended to 16.5"
Towing with a fifth wheel hitch is OK, but you can forget about using your truck for anything else! That massive hitch is always in your way. 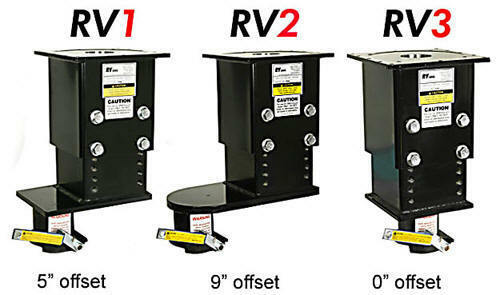 The new RV1 Fifth Wheel Adapter gets that colossal hunk out of your truck. Gooseneck-ball connection is tighter with more articulation than mini 5th wheel king pin connection. The trend is growing, balls are popping up all over and king pins being covered with Popup Adaptors. 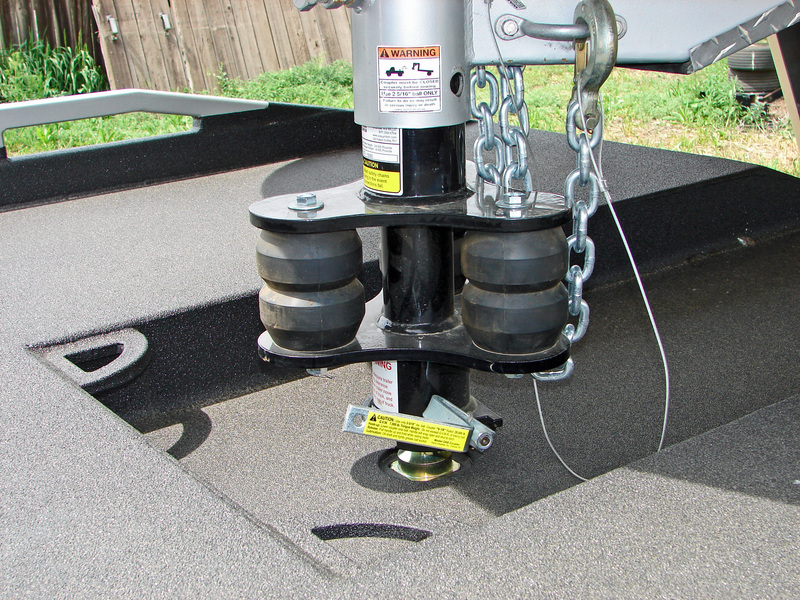 The new RV1 lets you tow your travel trailer with a standard gooseneck hitch ball. Use it with a PopUp Ball or a Flip-Over Ball and you can pull your RV trailer and still have a completely smooth fully usable truck bed anytime you want it. 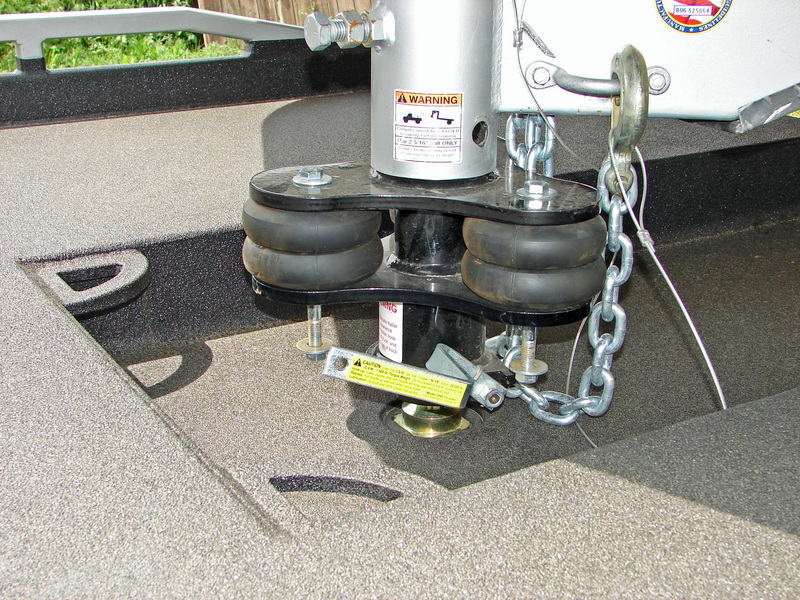 The RV1 Fifth Wheel Adapter safely fastens to the king pin on your travel trailer with a heavy machined bolt-on king-pin clamp and four self taping bolts into the king-pin box. . Installation takes about an hour. To make your towing experience better yet, this extended coupler is fitted with a spring loaded coupler. This coupler latches remotely when the trailer is lowered onto the ball. To uncouple you simply pull a release cable at the trailer jack. In addition to the convenience of remote coupler latching and release - the precision casting of the spring loaded coupler extends ball life. When you uncouple, the RV1 stays with the trailer - where the hitch should be - giving you full use of your truck bed for the other jobs you need to do. Fifth Wheel Gooseneck Adapter with Nine Inch Offset. Fitted with a spring loaded 2-5/16" coupler. RV4 conversion with 9 inch extension, King Pin to gooseneck ball conversion for flatbed trucks. The coupler tube is a couple of inches deeper than the RV1-2-3s to fit in a truck flatbed ball recessed box. The RV4's are designed for use with flatbed pickup trucks. They do not offer enough clearance over the side rails for standard pickup beds. RV4 with 7 1/2" fixed height and 4" from top of ball to bottom plate. RV4XL with 11 1/4" fixed height and 7 3/4" from top of ball to bottom plate. The difference is a longer tube from the coupler to the bottom plate. Everyone who tows an RV needs more clearance between the truck and trailer. You can always use more room for maneuvering, especially if your towing with a short bed truck. And, an extra ten inches between the rear bumper and the bulkhead of the trailer makes things easier, too. The RV5 gives you the extra clearance you need in a strong easy to install accessory. With these adapters, if your king pin plate is 3/16" or more, you can bolt adaptor to the king pin plate. If plate is less that 3/16" it would be better to weld adaptor to the king pin plate. Always inspect the king pin box before adding an extension or adaptor. You don’t sacrifice strength for smooth towing. With a gross trailer weight rating of 24,000 pounds and 8,000 pounds maximum tongue weight, this cushion coupler will take you wherever you’re going in remarkable comfort. The rubber inside the tube works as a guide for up and down motion as well as dampening front to back vibration. Designed to apply trailer cushion at different tongue weights, Cushion Coupler will work with a loaded or empty trailer or anywhere in between.